I bought this book about twenty-four hours ago, since then I have only read and slept. I do not often post favorite books on this blog, I have another blog for that. This book is different though. 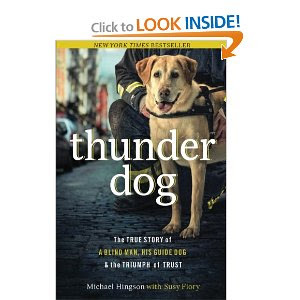 Michael Hingson and his guide dog Rocelle became famous after their escape from World Trade Center I on 9/11. Hingson and Rocelle were working on the 78th floor of the WTC building when American Airlines flight 11 hit the North Tower on that bright September morning in 2001.
. If you are blind or partially sighted you will recognize many of the situations, Hingson describes. If you love dog stories, you will love the devotion and loyalty shown by both man and dog in their own team, if you wonder how to treat the blind, this book will guide you. I highly recommend this book to be shared with anyone. Sighted or blind all will learn something of value from this book.